Below are the most common health tests that are advised, but please note there are other conditions that the dogs can develop but not all can be tested for. Clear DNA result – Has no inherited faulty genes from either parent and is clear of this form of PRA. Carrier DNA result – This dog would have inherited one faulty copy of the gene but will not develop PRA. It can however pass the faulty gene on. If a carrier is bred to a clear dog the litter would have 50% of puppies that are carriers and 50% clear. If a carrier is bred to a carrier,then litter would be 25% clear and 25% affected and 50% carriers. If a carrier was bred to an affected it would produce 50% carriers and 50% affected. Dogs that have carrier status should always be bred to a clear status dog. Affected DNA result – This dog would have two copies of the faulty gene which were inherited from each parent and could develop PRA.. If bred with a carrier it would produce 50% carrier and 50% affected. If bred with another affected the whole litter would be afffected. If bred with a clear dog , 100% would be carriers. Other eye tests and screening can be done by the BVA (British Veterinary Association). The BVA/KC ISDS eye scheme offers a means of identifying the presence or absence of inherited eye diseases in a variety of dog breeds. They recommend that breeders submit dogs for annual eye tests as some diseases have late onset of clinical signs. Ideally in our opinion both a DNA eye test and yearly screen should be carried out on breeding dogs. A DNA will give you a result that only needs to be done once and will show if dog will be affected, clear or carrier, a screen under BVA will identify eye conditions on the day the dog is examined, hence why they are recommended to be done yearly and/or as the BVA examiner advises. Recommended eye tests for Cockapoos and Spaniels and Miniature and Toy poodles. This condition has no known cure and is a progressive degenerate eye disease of the retina. It usually starts with the loss of night vision and can progress to total blindness. This is an auto recessive genetic disease . By knowing the dogs results it is possible to breed appropriately to ensure no future litters are affected and also to be aware of what dogs are carriers. CPRA (Central Progressive Retinal Atrophy)/ RPED: Recommended test for English Cocker Spaniels. This doesn't always lead to a total loss of vision and in some cases peripheral vision is maintained. Goniodysgenesis/Primary Glaucoma: Recommended for English and American Cockers. This is a painful and sight threatening disease and damage cannot be reversed. Multifocal Retinal Dysplasia: Recommended for American Cocker Spaniels. This is a congenital disorder (present at birth) in which the retina doesn't develop properly. Can be inherited from parents or acquired by way of infections. Non- Congenital Hereditary Cataracts: Recommended for Standard Poodles and American Cocker Spaniels. These cause visual impairment and can lead to blindness and the treatment for them is surgical removal. This is a kidney disease. Dogs with FN typically develop chronic renal failure between 6 months and 2 years of age, with eventual and sometimes rapid destruction of both kidneys. The early clinical signs are the same as those associated with chronic renal failure due to any other cause. These include excessive water consumption, excessive urine volume, reduced growth rate or weight loss, poor quality hair coat, reduced appetite, and vomiting. Persistent high levels of protein in the urine of a young English Cocker Spaniels most often proves to be due to FN. This can be DNA tested by : Antagene in France. Labolkin in UK or Optigen in America. Phosphofructokinase (PFK) is an enzyme that is crucial for production of energy from sugar sources in all cells of the body, especially red blood cells and muscle cells. Lack of this enzyme causes a range of effects: weakness and muscle cramps, discoloured urine, anaemia and jaundice. In Spaniels, this disease is inherited as an autosomal recessive condition. This can be DNA tested by Optigen in America or Laboklin in UK. Patellar luxation: Please see our article on Luxating Patellas. This is a congenital disease which affects the legs. It results in intermittent lameness and is a slow progressive disease. More commonly found in Standard Poodles and is recommended test by KC for standards. Toy and Mini Poodles can be tested, but currently to best of our knowledge only via Laboklin. 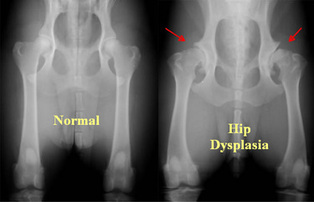 Hip Dysplasia: Please see our article click here : Hip Dysplasia. HD can be tested at a minimum of 1 years of age and only scored the once under the BVA scheme. A vet will take x-rays of the hips and these are sent to the BVA experts who "score" them. Hips are scored from 0 to a max of 106 (53 for each hip) the lower the score the better. Results are shown as a mean average breed score known as BMS that can be found via the BVA website.